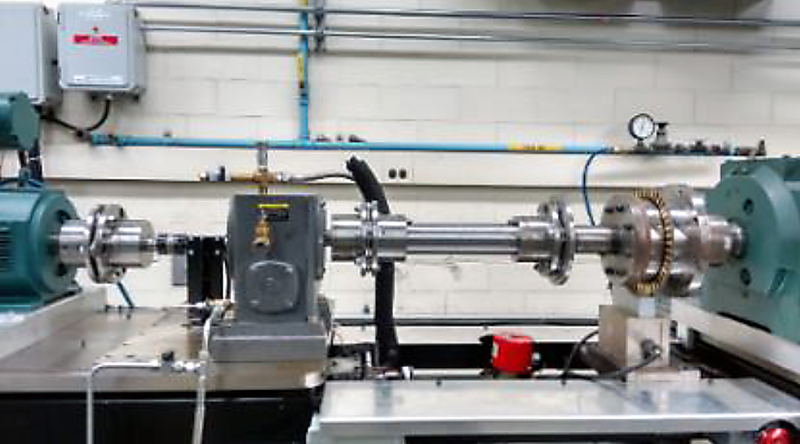 Fluid evaluations were conducted using an efficiency rig instrumented with a production-scale worm gearbox. Testing was conducted under a wide range of speeds and loading, and pronounced differentiation among fluids was observed for their impact on power loss and operating temperature. Gearboxes found in mining and manufacturing sectors encounter a variety of harsh conditions. Heavy loading, longer duty cycles, and high operating temperatures constitute a typical operating environment; ingress of contaminants such as particulates and water may add to the problem. Contributing to further duress, gearbox size reductions have also led to elevated operating temperatures. The challenge, clearly, is to improve efficiency and equipment life while maintaining higher levels of throughput. 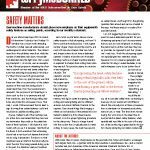 Improved metallurgy and surface finish can positively affect power loss, but effecting changes to the equipment can be expensive, and changeovers result in idle time and lost productivity. A second and more practical way to reduce power losses is through an improved lubricant — one that dissipates frictional heat while maintaining a high level of load-bearing protection. Changing the lubricant is relatively inexpensive and can be easily accomplished with minimal loss in productivity. This paper focuses upon lubricants that improve operating efficiency and reduce operating temperature. Selecting the proper lubricant can significantly improve gearbox efficiency. A good lubricant dissipates frictional heat and protects the gearbox from wear and fatigue. Key formulating considerations are viscosity, traction, thickening power, fluid film integrity, and a well-balanced additive system. Viscosity of the gearbox lubricant is dependent on the recommendation of the gearbox manufacturer and typically ranges from ISO VG 150 to ISO VG 460. Viscosities outside of this range are also utilized under certain special conditions. In order to achieve a target commercial viscosity grade, a low viscosity base fluid is typically thickened by a component such as a bright stock, a viscous poly-alpha-olefin (PAO) or a polymer. Two key factors should be considered when selecting a thickening agent: its thickening power and the shear stability it imposes. The base medium and thickeners maintain the fluid film integrity and affect the frictional properties of the final formulated fluid. 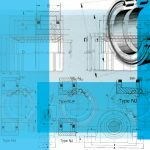 When the fluid components have been defined, the appropriate additive package must be included in order to protect the gearbox from wear, friction, corrosion, rust, and other forms of damage. 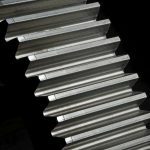 Additive packages are typically selected to meet performance requirements outlined in important industry specifications such as AGMA 9005-F16, DIN 51517 Part 3, and U.S. Steel 224. For this work, four thickeners were selected, each having a different chemical structure and thickening power: denoted as Thickeners A, B, C, and D. These thickeners were each dosed into the same synthetic base oil and blended to a targeted viscosity grade of ISO VG 320. 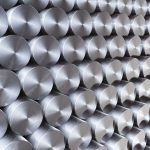 In all cases, the same additive package was included, and all fluids satisfied U.S. Steel 224 and AGMA 9005-F16 requirements. Two reference oils were also selected — a mineral oil-based lubricant and a commercially available synthetic lubricant. Viscometrics, traction coefficients, and shear stability of all the oils were then determined. The mineral-based reference fluid is designated Reference 1; the commercially available synthetic gear oil lubricant was designated Reference 2. The physical properties of the references and four candidate fluids are summarized in Table 1. The fluids in Table 1 were tested in the Mini Traction Machine (MTM), which measures traction coefficient under full fluid film regime . Traction is fluid’s internal resistance to flow and primarily depends on the molecular structure of the bulk fluid; traction is not solely dependent on the additive chemistry. The tribological contact mode is ball-on-disk where a sliding contact is imposed upon a rolling contact under elastohydrodynamic conditions. The test commences at 100-percent rolling contact and then progresses through increasing levels of sliding contact. For all six fluids, traction coefficients were measured over a wide range of sliding-rolling contact at 1.25 GPa load and 2.5 m/s speed; traction coefficient profiles were generated at both 40°C and 100°C. Figure 1 and Figure 2 are plots of traction coefficient measured at fixed temperature (40°C and 100°C, respectively) as a function of percent sliding. 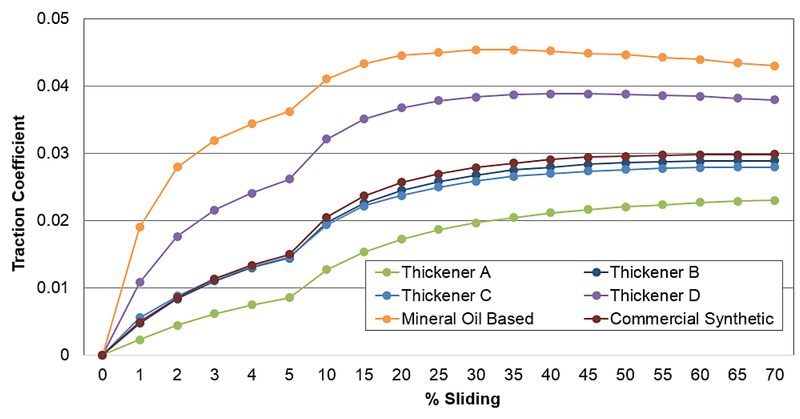 From Figure 1 and Figure 2, it is evident that Oil 1, containing Thickener A, has the lowest traction coefficient, and the mineral oil-based reference (Reference 1) has the highest traction coefficient. Interestingly, when the same six fluids were tested at 100°C, the differentiation between Oil 1 and mineral oil-based reference (Reference 1) widens, even though oil viscosities at 100°C now differ. Fluids were blended to the same viscosity at 100°C, and traction profiles were generated to confirm the trend. As mentioned before, the thickeners selected for these experiments had different molecular structures. The molecular weight and chemical architecture of the various thickening agents determine their relative thickening power in a particular base medium. In order to reach a target viscosity, different thickening agents may treat at different levels; the lower the treat rate, the greater the thickening power. Polymeric thickeners may undergo temporary or permanent shear loss when subjected to high shear stress. When a polymer suffers permanent shear loss, its effectiveness as a thickener is diminished. Furthermore, important performance properties, such as wear protection, may be compromised when a lubricant shears out of grade. The KRL bearing shear test  is generally a good barometer of gear oil shear stability; in this method, the oil is passed through a tapered roller bearing for 20 hours under load. Comparative KRL shear results of candidate fluids are given in Table 2. 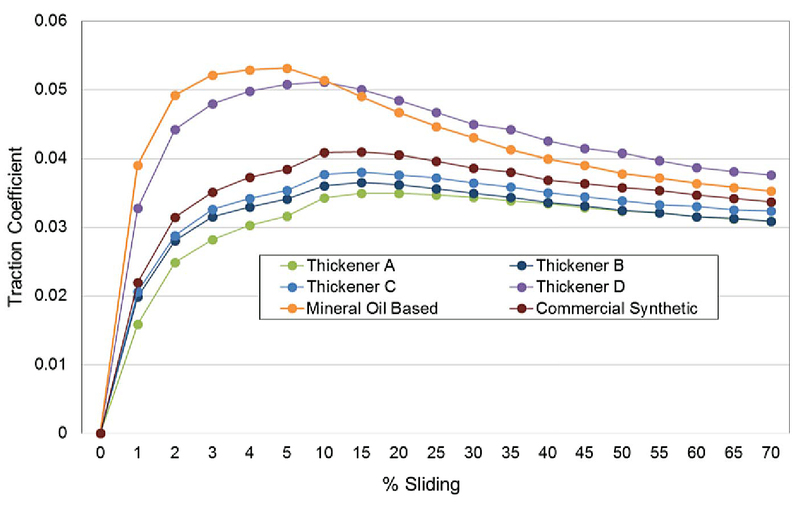 The thickeners tested in Table 2 indicates that Thickener B (Oil 2) delivers the best shear stability; however, Thickener B is dosed at a much higher level, which increases the total formulating cost. The fluid containing Thickener A (Oil 1) produces a moderately greater shear rate but treats at a much lower level and delivers the lowest traction profile. 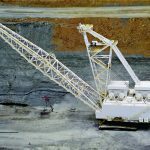 These physical properties would suggest that Thickener A may offer the best balance of operating efficiency, shear stability, and economics. In the next section, we evaluate this hypothesis in a production-scale gearbox test. The efficiency of any gearbox will vary depending on the demands under which it operates. 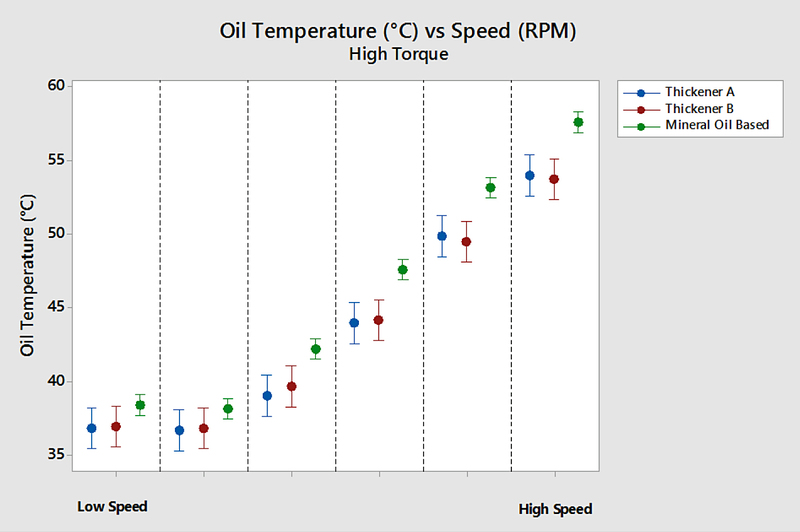 In this study, oil temperature, torque, and speed were the primary input conditions. Figure 3 shows a simplification of the observed effect of each parameter on efficiency. 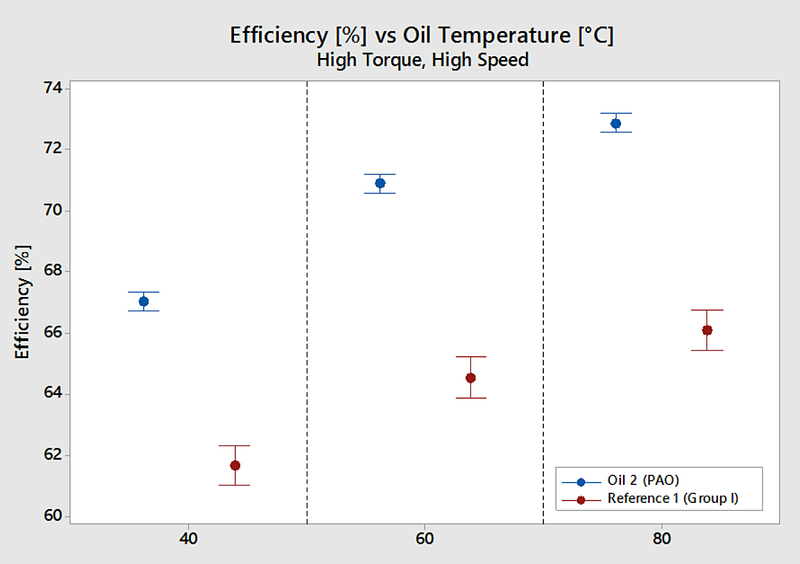 Oil temperature had the greatest impact, and the effect was not highly dependent on either torque or speed. 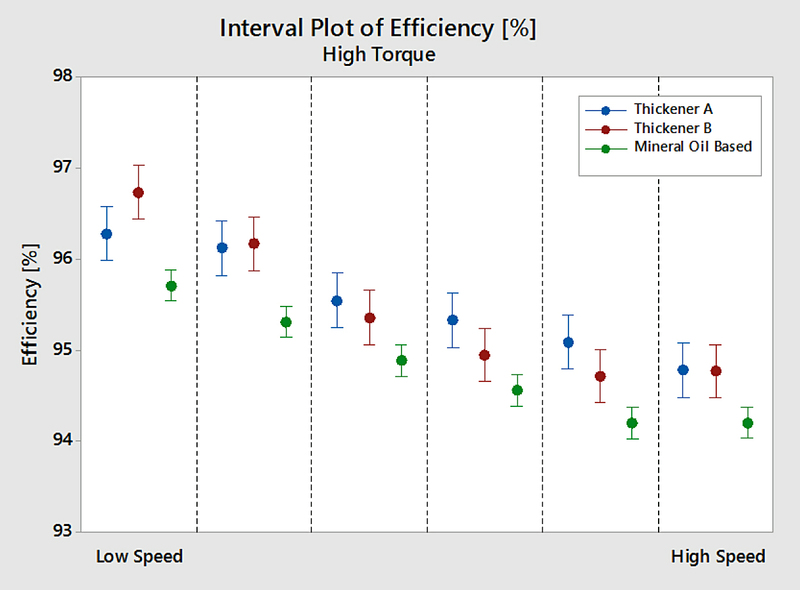 Increases in torque yielded higher efficiency in general, but the effect was less pronounced in the higher torque ranges. The effect of speed on efficiency was dependent upon torque. Initial efforts focused on developing an efficiency test with a helical gearbox. Helical gearboxes, widely used in manufacturing and mining, have high inherent mechanical efficiency (up to 98-percent rated efficiency). A triple reduction configuration was selected in order to reduce the mechanical efficiency, and in turn, effect greater differentiation among lubricants. The gearbox was installed in a test rig, which allowed input speed to be controlled by one electric motor and output torque to be controlled by a second electric motor. 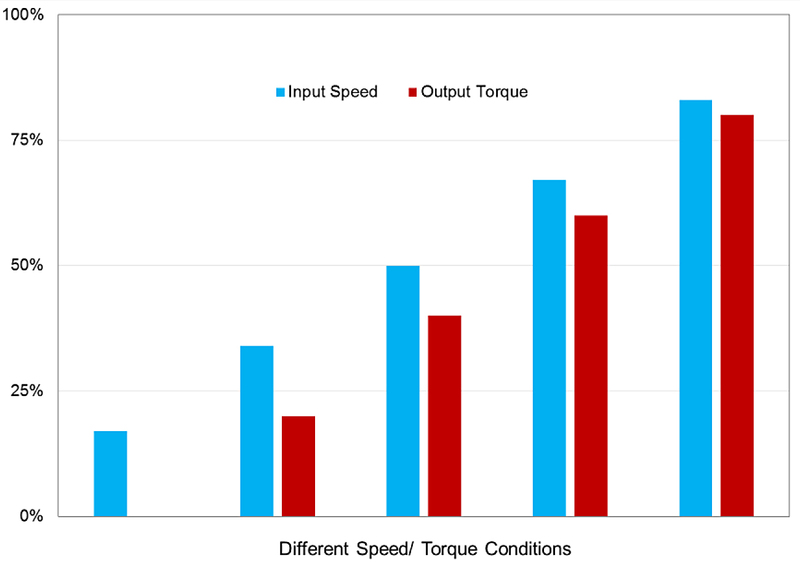 Torque and shaft speed were measured on both the input and output sides of the gearbox, and efficiency was calculated from these measurements using Equation 1. An oil temperature control circuit with both heating and cooling was implemented to allow testing at a controlled temperature. A photograph of the test rig is shown in Figure 4. A matrix of conditions was developed, which spanned the rated speed and torque ranges of the helical gearbox. Initially, oil temperature was controlled at 40°C, and efficiency was measured under each combination of conditions. These conditions are shown in Figure 5. After sufficient break-in of the gearbox, a set of oils was run through the test. The focus of the experiment was to evaluate the efficiency of a mineral oil versus two synthetic oils of the same viscosity grade. All samples were blended to ISO VG 220. All tests were run on the same hardware, with flushes between tests. 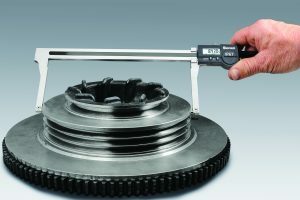 The mineral oil-based reference sample was repeated frequently to monitor drift in efficiency measurements due to cumulative wear on the gears. The first tests were run at 40°C. While there appeared to be a significant efficiency improvement for synthetic oils over the mineral oil-based reference, differences were statistically insignificant in most cases. Results are shown in Figure 6. Tests were also run using the same matrix of conditions but without controlling the oil temperature. Recirculation was turned off, and the test oil temperature was allowed to equilibrate at each stage. The mineral oil-based reference ran at slightly higher temperatures than the two synthetics, especially at higher speeds; this makes sense given the slightly lower measured efficiency of the former. 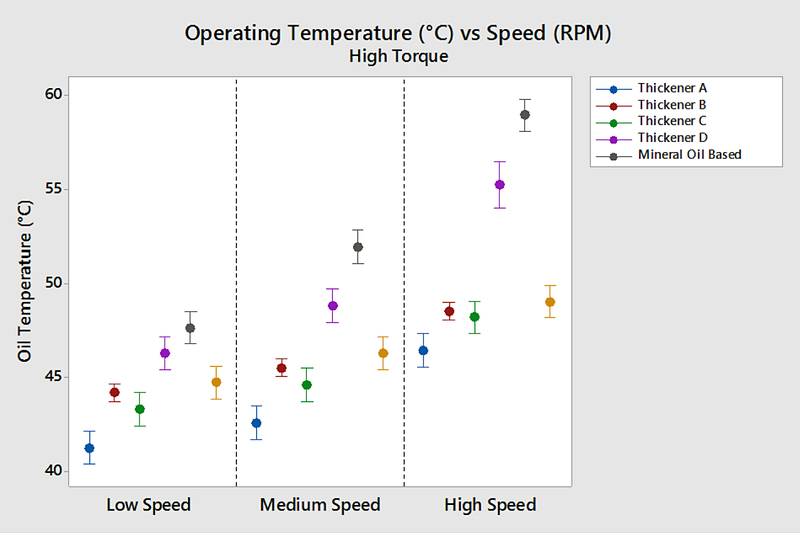 Example results from the highest torque stage are shown in Figure 7. 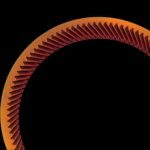 To take a broader look at the helical gearbox efficiency, additional tests were run using a temperature sweep from room temperature up to 80°C, under a smaller subset of speed and torque conditions. Results of the temperature sweep tests are shown in Figure 8. While the greatest differences between the mineral oil-based reference and the synthetics were observed at the highest torque and lowest speed condition, the efficiency differences between synthetic samples were still statistically insignificant. 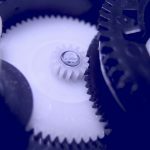 These are the conditions under which the lubricant film between the gears would be thinnest and the potential for metal-to-metal contact would be greatest. Due to the high mechanical efficiency of helical gears, differentiating among lubricant formulations was difficult. Some results suggest a potential difference between Thickeners A and B, but a more discriminatory test was needed to investigate further. 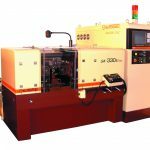 The decision was made to continue efficiency testing in a worm gearbox because the lower inherent mechanical efficiency of worm gears allows greater differentiation among lubricants. The rated mechanical efficiency for worm gearboxes is typically in the vicinity of 60 percent. The relatively low efficiency of worm gears is due to the pure sliding motion between the worm and wheel. The greater the slide-to-roll ratio inherent to the gear geometry, the less efficient the gearbox will be. 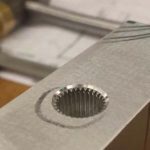 While efficiency differences observed in a worm gearbox test are relevant to efficiency in other types of gears (i.e., bevel, spur, and helical), the differences will be smaller in gear types with lower slide-to-roll ratio. The general layout of the worm gear efficiency test rig was similar to that of the helical gearbox rig. A schematic is shown in Figure 9. A similar strategy was employed in selecting a range of test conditions. A list of the conditions is shown in Table 3. All combinations of these conditions were tested, yielding a total of 27 separate efficiency measurements. After a sufficient break-in period, mineral oil-based (Reference 1) and synthetic (Oil 2) samples were tested as bookends to determine the discrimination of the test and test repeatability. As shown in Figure 10, the efficiency difference between the two samples is statistically significant. The synthetic candidates described in Table 1 were tested along with mineral oil-based and commercial synthetic references. 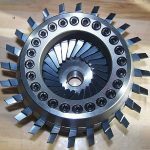 The worm gear test, due to its inherent mechanical inefficiency, yielded greater differentiation among lubricants in both efficiency and operating temperature performance. 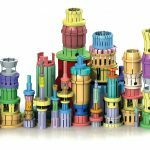 Unlike the helical gear test, the worm gear test differentiated the synthetic formulations. The greatest difference was apparent between the mineral oil and the synthetics as a group; some synthetic fluids showed efficiency advantages of up to 8 percent over the mineral oil. 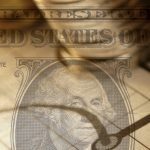 Among the synthetics, differences of up to 5 percent were observed. 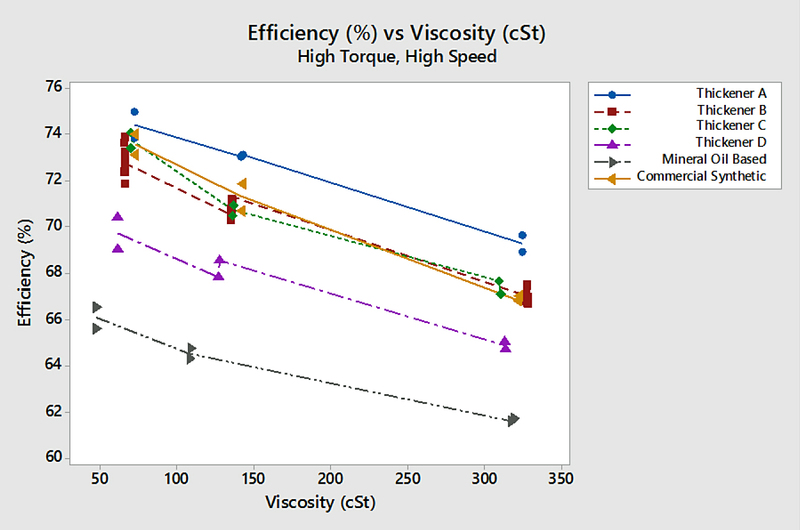 Figure 11 shows efficiency results obtained under the highest torque and speed conditions. Differentiation was most evident at high torque, but the same trends were seen across all the conditions. 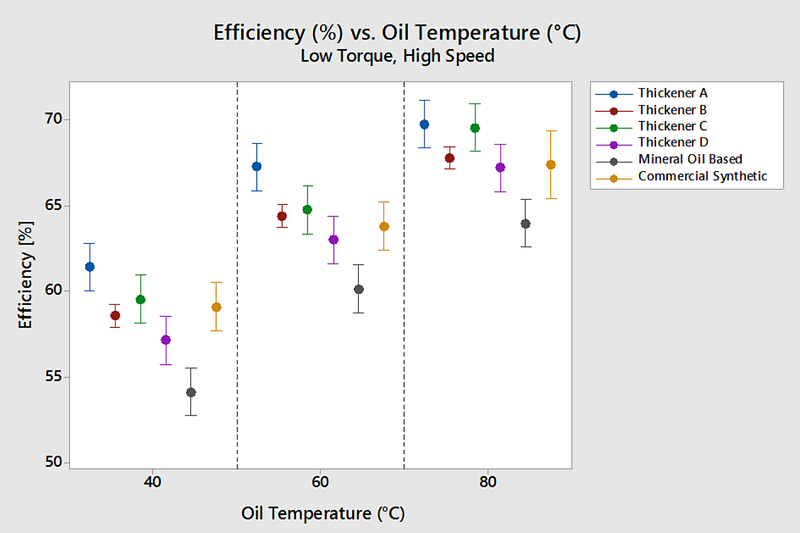 For comparison, Figure 12 shows the efficiency measurements under lowest torque. Under all conditions, Thickener A offers the greatest efficiency advantage. Efficiency measurements were also plotted as a function of viscosity to factor out the effect of minor differences in viscosity among the various fluids. 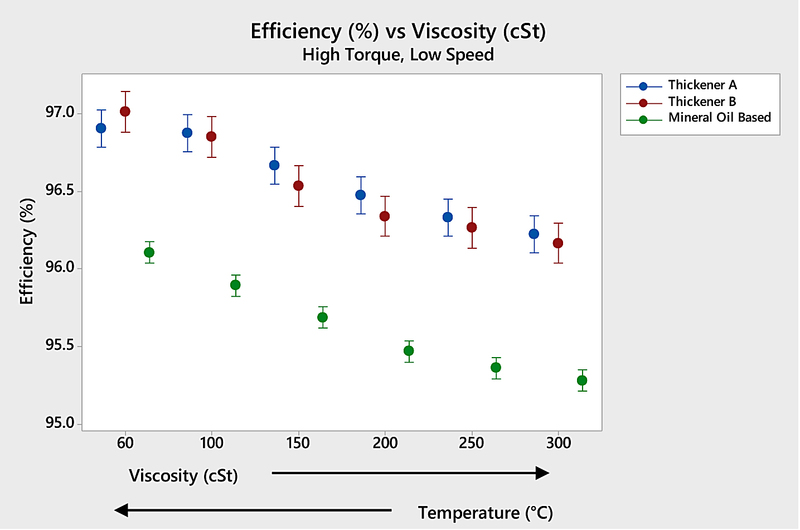 Figure 13 represents efficiency versus viscosity under highest torque and speed conditions. 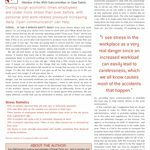 Multiple data points represent repeat tests. Viscosity measurements were taken via ASTM D445 at both 40°C and 100°C before and after the tests; minimal (less than 1 percent) viscosity loss was measured. This analysis confirms that Thickener A clearly offers the greatest efficiency. 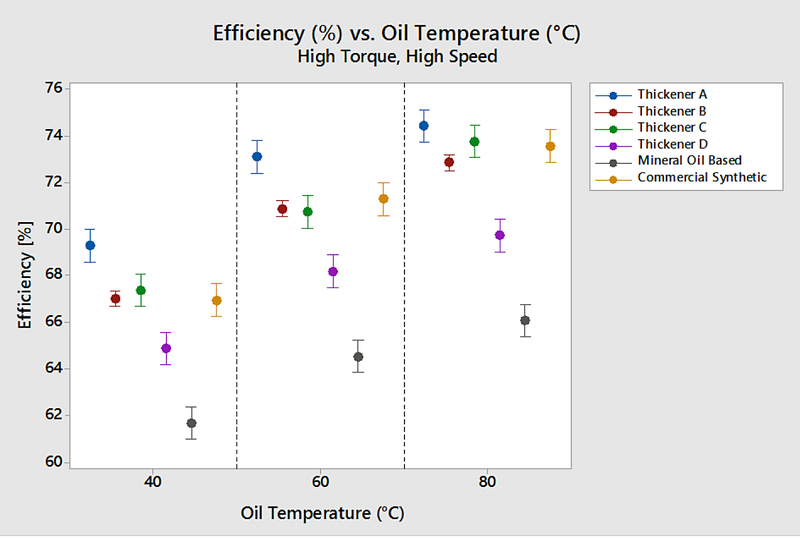 Significant differences in operating temperature were also observed when the test was run without controlling oil temperature in the gearbox. Under high torque, the most efficient synthetic oil ran up to 12°C cooler than the mineral oil. Among the synthetic oils, differences of up to 8°C were observed, emphasizing the importance of choosing the right gear oil, even among synthetics. 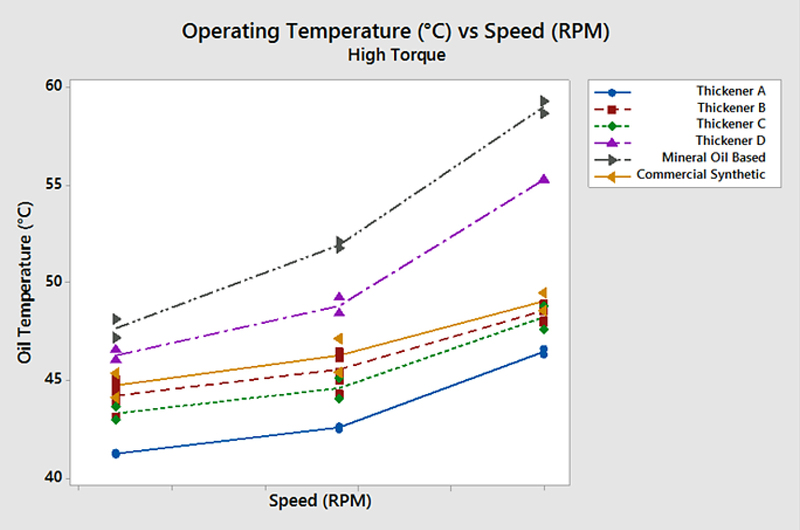 Figure 14 shows operating temperature across the speed range, under high torque. As confirmed in Figure 15, the differences in operating temperature are statistically significant. Formulating gearbox lubricants for high efficiency and operating temperature control is challenging and requires the balancing of many different physical and performance properties. In addition to the impact of a robust additive package, an all-inclusive formulating strategy must consider inherent traction, shear stability, and thickening power. 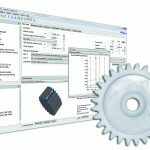 This comprehensive approach was validated in a production-scale worm gear efficiency rig, which revealed excellent differentiation among a wide range of fluids. Utilizing this testing, synthetic gear oils were designed for optimal efficiency, operating temperature reduction, and fluid durability under extreme conditions of loading and speed. The impact of different performance attributes described in this paper can be summarized in a qualitative way, as shown in Table 4. Thickener A seems to show a clear advantage in the treat rate, traction coefficient, and operating efficiency while demonstrating a good shear profile. 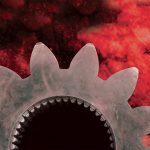 These factors need to be considered, along with selecting an appropriate base oil and additive package, in order to develop an energy-efficient industrial gear oil. 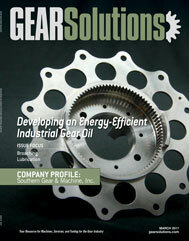 Rensselar, J. V., 2013, “Trends in Industrial Gear Oils” Tribology and Lubrication Technology (2) pp 26–33. Vinci, J. N., Akucewich, E. S., Cain, R. W. and Qurreshi, F. S., 2002, “Developing Next Generation Axle Fluids: Part II – Systematic Formulating Approach” SAE International 2002-01-1692. Schnur, E., 1996, “Evaluating Gear Lubricating Shear Stability” SAE International 961108.
has worked as a research engineer with The Lubrizol Corporation since 2011, specializing in bench-scale and full component mechanical test development. Wilkerson has a degree in mechanical engineering from The Ohio State University. technology manager, worked for The Lubrizol Corporation for more than 44 years. He developed different fluid formulations focusing primarily on automotive and industrial gear oils. He retired late 2016.
works as a technology manager with The Lubrizol Corporation, where she formulates lubricating additives for hydraulic and industrial gear oils. Basu has been with Lubrizol since 2007 and has a Ph.D. in chemistry from Case Western Reserve University.